A while back I wrote a blog entry asking how to define the boundary between glyph variant and calligraphic art. Today I ran into the case that I really thinks highlights how complex it is. The Bishmallah character is in the Arabic presentation block and it visually jumped out at me because it was so complex in comparison to every other symbol. You can see the character below at 288 point, 36 point, and 14 point. My initial reaction? Wow, what a beauty. The full name of the sign in the Unicode spec is "ARABIC LIGATURE BISMILLAH AR-RAHMAN AR-RAHEEM" and it is assigned to Unicode Point U+FDFD. According to my research, this phrase translates to "In the name of God (Allah), Most Gracious, Most Merciful/Compassionate" (translations vary). It begins every chapter of the Koran (Qur'an) except one and is used in prayers and is apparently used in other contexts including preambles of several constitutions in the Islamic world. Wikipedia has a good overview of the Bismallah/Basmala. It has a deep spiritual meaning and this phrase has become the basis of many pieces of Arabic calligraphy. Since the phrase is so common in Islamic religion, it makes sense that a special sign may be needed. Having said that, there are several technical challenges that can be considered. One is the complexity of the sign itself. As you can see in the images above, at 14 points, it looks almost like a piece of lace with none of the characters distinguishable. The structure is not really visible until the point count is in the 30s (headline size), and even then it the size should be larger to gain full appreciation of its design. It is clearly not meant to be a simple logogram incoporated into a text. 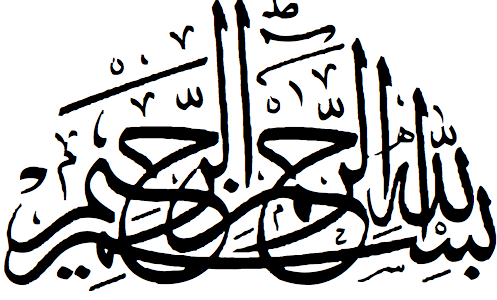 More interestingly, there are many variations in what a calligraphic Bismallah looks like. You can see examples from Flickr User Said Bak, Islam 101 and eleswhere. Some look like cirlcles others birds or fruits and many are artistic lines. Based on the examples I've seen the creation of new forms of Bismallah is a vibrant art form. So the question is...with so many variations, which variation do you select for your font? It does look like there are standard forms (past masterpieces I am assuming). The font I used is PakType Naskh (from Pakistan) and the designers selected a semi-circular form. At one level the technical challenge has been overcome, but it still does not answer address the question of information versus art. The symbol in the PakType font is beautiful but will future generations think that the Bismallah should have a set form or will the calligraphic tradition survive? And the tricky question - will there be variants encoded for archival purposes or where there will be one Unicode point with an infinite number of a variations. I know I do not have the answer to that one. I was comparing notes for the Arabic block and noticed some new additions for which I was getting Unicode box of death (i.e. none of my fonts have that symbols). Some of them are actually Arabic math symbols which were recently added. You can read about them in the proposal at http://std.dkuug.dk/jtc1/sc2/wg2/docs/n3086-1.pdf But of course I MUST find fonts to cover these extra symbols. Some of this can be handled by using different symbols when working with Arabic math text, but it's good to have a reference glyph. It looks like the latest Unicode Symbols font has the Outlined White Star (5 points, rounded corners = U+269D). An interesting conundrum are arrows which are designated "LEFTWARDS" or "RIGHTWARDS". If I understand the proposal correctly, it appears that the conventions for which arrow is forwards or backwards would be be reverse in Arabic, so mirroring conventions are needed when using mathematical arrows in a RTL language. Still hunting down Arabic fonts for some of the Unicode 5 characters, but I did find a W3C page describing Arabic mathematical typesetting. http://www.w3.org/TR/arabic-math/. Note that the some of the code is still theoretical. One set of fonts I didn't have a chance to include in last week's font wrap are Arabic script fonts. When discussing Arabic script fonts, it's important to note which language or region a font has a been design for because the requirements for writing Arabic versus Persian versus Urdu and so forth can vary (just as they do for English vs. German). I also generally recommend Gallery of Unicode fonts which is a Unicode font directory. The Web master very helpfully splits many of the fonts into separate language pages.